Profitez de la sérénité de cette unité de coin tranquille, entouré par l'Histoire. Ceci est une propriété résidentielle. Nous ne pouvons pas accueillir les célébrations bruyantes ou de bruit au-delà du 22 heures exigence de temps calme ..
Condo est disponible du 18 septembre 2018 au 18 mai 2019 pour la location à long terme seulement. Vicki's condo was clean, quiet, and very comfortable. We loved staying above the Mercado and enjoyed a couple of the restaurants while we were there. The location is close to downtown, about a 20 minute walk or a five minute drive. The condo is bright with super high ceilings making it feel extra airy. Thank you for a lovely stay in Traverse City! Thank you so much for taking the time to write a review. It's always nice to know our guests liked the condo and enjoyed the Traverse City area. We hope you will visit again. Thank you for taking the time to write a review. We're so happy you enjoyed your stay. You were great guests. Hope you get to come this way again soon. It is always a pleasure to have the two of you stay in our condo. We so appreciate your returning each year and your kind comments. 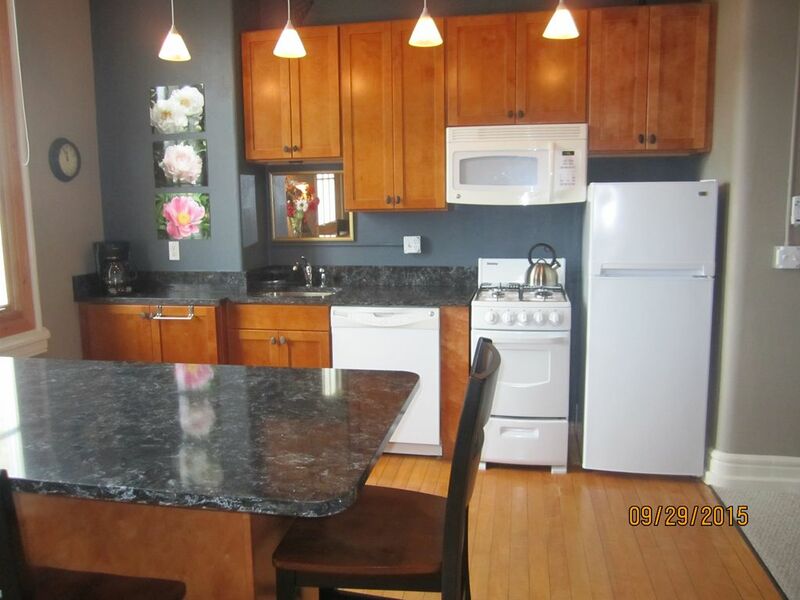 Very tidy one bedroom condo in the historic Grand Traverse Commons. I lived here over the late fall and winter and really enjoyed it. It would be even more fun in the summer within such close distance to downtown and all the other activities. Also, great shops and restaurants in the same development! We appreciate John's review of our condo. He was one of the best winter tenants that we've ever had. He left it in great shape. You would hardly know anyone had lived there. It is in a good location to enjoy the winter or summer in the Traverse City area. Vicki was very accomdating.. We arrived later in the evening(and got lost). Vicki assited us with directions and showing around the place. The condo was very cozy and quaint! Plenty of restaurants to choose from in the Villages. The condo is also convienantly located as it's a short drive to downtown. Very Clean. Nice location. Plenty of "walking distance" restaurants and small shops. Very quiet and nice park-like grounds. Owner is veteran landlord and it was great to deal with them. Rates are subject to change until reservation confirmed. Cancel by April 30, 2018 receive refund of deposit. After April 30th I will relist the property as available. If rented, I will return your deposit PROPERTY ONLY RENTS ON AN EIGHT MONTH LONG TERM LEASE STARTING SEPT 15, 2018 THROUGH MAY 15 2019. Please contact us for details.